Welcome to Valhalla - the universe of the Norse Gods in graphic details! Click on any of the comic albums to see whole finished pages, sketches from the preparatory stages and a description of the sources of each myth. The award-winning Valhalla albums have been published in eleven different languages. Volume 1 has so far sold more than 100,000 copies in Denmark alone. 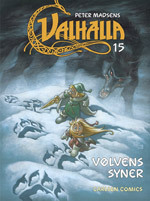 Valhalla: The Complete Saga 1-5.
Who is who among the Norse gods?